More from the February issue. John Rowan’s letter (‘Away with the triangle!’, January 2015) commented on my article ‘Maslow’s Hierarchy of Needs – the sixth level’ (December 2014). He is correct in stating that Maslow never used the triangle method of illustration, which was actually devised by someone unknown. The reason I did not point this out myself was because I did not consider it relevant to the purpose of the article. His next point is more interesting: ‘What is wrong with the triangle is that it suggests that there is an end-point to personal growth. …[and] this end-point is not far away. … Ken Wilber… made it clear that what Maslow was talking about, and describing in some detail as the level of self-actualisation, was a level of consciousness that Wilber calls the Centaur self…and which Wade…calls the Authentic self.’ On this basis he turns the triangle into a ladder and adds further levels of consciousness, the ladder having no end-point. The problem with this interpretation is that it involves category error. If Maslow’s six levels represented levels of consciousness then Rowan’s comments would be valid. Unfortunately they do not, in spite of what Wilber is reported to have written. Instead they are categories of motivating needs which are associated with each of those same levels of consciousness. 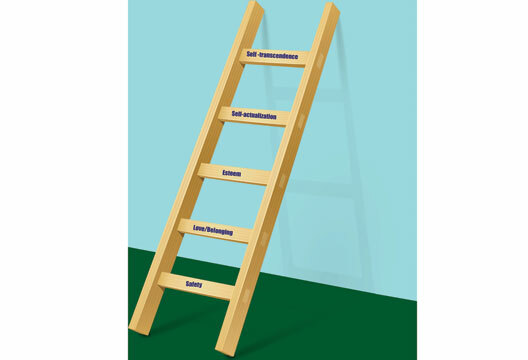 Consequently a ladder of higher levels of consciousness cannot be attached to the top of the hierarchy of needs. They are chalk and cheese. Maslow’s hierarchy deals with the current level of biological evolution reached by the human species and that is why it has an end-point. It has little to do with personal growth, however that is defined. This becomes clear if one considers the dark side of each of his levels. For example, ‘Physiological’ includes the drug addict’s need for the next fix, ‘Safety’ includes paranoia, ‘Belonging’ includes prejudice against those who do not belong, ‘Esteem’ includes achieving self-esteem by putting others down, while ‘Intrinsic values’ includes the religious beliefs of terrorists. Which brings us to the question of how to define personal growth. Rowan clearly defines it in terms of the ladder of states of consciousness. However, I have always understood it to mean an individual’s journey of achieving liberation from unconscious programmes which control us and that this is achieved through insights. In other words, Carl Jung’s individuation coupled with Zen-like self-exploration. The aim is stages of enlightenment and not higher states of consciousness although the latter may happen on the way. I wonder if these two perceptions of personal growth are reflected by those who practise concentrative meditation and those who practise mindfulness meditation. Where we do agree is that there is no achievable end-point to personal growth. False beliefs about false beliefs? I was curious to apply the Smarties task with my two-year-old son (2 years 3 months). For those unfamiliar with the Smarties task, it goes like this: A Smarties tube is shown to a child, and the child is asked what is inside. After the child answers ‘Candies’, the experimenter shows what is inside: a pencil. Afterwards a child is asked ‘What did you think was inside before I showed you?’. My son answered ‘Candies’. Great right? Well, it wasn’t quite what I expected. The literature says children pass this task at around the age of three and a half to four years. A typical answer of a child his age would be that she/he thought a pencil was inside (i.e. a child cannot represent the mental state of false belief, but only the actual state). I asked several friends of mine who have children younger than three years to do this task with their youngsters. Imagine my surprise when all friends reported outcomes like mine. Studies show us that 15-month-old-infants have implicit understanding of false beliefs, and other experimental methods confirm this. It is thus unbelievable to me that it takes so long for children to be explicitly aware of false beliefs. Psychologist have been aware for some time that the strange situation children are put in influences the answers they give, but the role of the experimenter (that is to say who puts them in the strange situation) has been neglected. Rarely do studies report that the experimenter has been familiarised with the children by spending at least few days in the kindergarten with them. I wonder whether my two-year-old son would give the same answer if he is taken out of his classroom and put in a different quiet room with an experimenter (which is usually done) to play a game (a story often told to children before conducting the experiment)? I am not suggesting that experiments as such should be abandoned, but that we are not getting the full picture of children’s development by adhering to controlled experiments that lack ecological validity. Perhaps developmental psychologists should find a way to incorporate more research paradigms for a single problem, or modify the existing ones. Thus converging evidence might make the findings more trustworthy, or perhaps diverging evidence might point us in the right direction. I was interested to read the article in the October issue (‘New gambling research centre’) and a follow-up letter in the December issue by Dr Neil Smith and Dr Henrietta Bowden-Jones (‘Help for problem gamblers’). I would like to raise two issues. First, the issue of whether problem gambling should be treated via the NHS is not new and has been debated for many years (Griffiths, 2001, 2004) and over the last 20 years a number of NHS hospitals have housed dedicated treatment facilities for problem gamblers only for them to close due to lack of funding (e.g. NHS Sheffield in the 1990s). I also authored the British Medical Association’s report on problem gambling in which I recommended that problem gamblers should be able to get treatment via the NHS (Griffiths, 2007). Readers may be interested to know Dr Jane Rigbye and I sent letters to all healthcare Trusts in the UK requesting information about problem gambling service provision under the Freedom of Information Act (Rigbye & Griffiths, 2011). We reported that 97 per cent of the Trusts did not provide any service (specialist or otherwise) for treating those with gambling problems. Only one Trust offered dedicated specialist help for problem gambling. However, we also found some evidence that problem gamblers may get treatment via the NHS if that person has other comorbid disorders as the primary referral problem. Second, Smith and Bowden-Jones wrote that there were ‘greater numbers of gamblers developing problems in the UK’. The latest 2014 study using combined data from both the Health Survey for England and the Scottish Health Survey (Wardle et al., 2014) showed the problem gambling level to be 0.5 per cent in the adult population. While this is still a significant problem, the level of problem gambling was substantially lower than the 2010 British Gambling Survey (0.9 per cent). There is actually no empirical data to show problem gambling has increased in Great Britain over the last four years. Griffiths, M.D. (2001). Gambling – An emerging area of concern for health psychologists. Journal of Health Psychology, 6, 477–479. Rigbye, J. & Griffiths, M.D. (2011). Problem gambling treatment within the British NHS. International Journal of Mental Health and Addiction, 9, 276–281. Wardle, H., Seabury, C., Ahmed, H. et al. (2014). Gambling behaviour in England and Scotland: Findings from the Health Survey for England 2012 and Scottish Health Survey 2012. London: NatCen. New low for legal highs? I write to you as the Service Manager for a supported housing project that helps ex-offenders resettle in the community after release from prison. We are increasingly facing problems with so called ‘legal highs’ (or novel psychoactive substances), where scientists are tinkering with the chemical compounds of existing drugs, such as MDMA, so they are no longer the same controlled substance. I can summarise my knowledge and experience in a few words: extremely potent, extremely cheap and extremely dangerous. As we have experienced with alcohol, many individuals who have successfully battled addictions with illegal substances such as heroin or amphetamines are replacing them with these legal highs, two of the most prominent being ‘Posh’ and ‘Spice’ (no connection!). I am now witnessing individuals experiencing psychosis and symptoms we would have usually only seen after years of serious amphetamine abuse. One substance named ‘Pandora’s Box’ (the packet gives a great visual image of the effects) seems to trigger psychosis, and it is terrifying to witness the effects – and working with this client group I don’t say that lightly. In a bid to do some research, a colleague and I went into a ‘head shop’ to see what we could learn. We found: (1) the shop staff are very well primed not to talk to anyone about any of it – every question was answered ‘it’s not for human consumption’; (2) it is a bizarre experience to witness what is essentially drug dealing over the counter; and (3) for five minutes on a weekday afternoon we saw a huge amount of people buying packets of substances they are willing to take with no idea what is in them. One of the most alarming aspects of this new trend is the assumption by many individuals (including hardened drug takers) that because they are legal, these substances are safe. Drug services are not equipped to deal with this new wave of substances, and we are all, as far as I can tell, working blind. All my colleagues and partners in drugs service are of the same opinion: we would much rather people continued to take illegal drugs as the damage seems to be considerably less and at least we know what we are dealing with. The reason I write to The Psychologist (for the first time) is to plead for help. First, is there any research out there being conducted that may support those of us working with these NPSs? Second, I would like to hear from others experiencing similar issues and whether they have implemented any successful interventions. One day, this may inform the debate around the legalisation of drugs and certainly could provide another aspect to the debate around research hallucinogens. I believe we have a duty to understand as much as we can about this to ensure we have the interventions to deal with it… and quick, before one more needless death or incident that could have been prevented. We have read philosophical and religious perspectives on assisted dying (Letters, December 2014). May I put forward one from social psychology? As social psychologists, we focus on the tensions that arise between individuals and society. The conceptual tool of social representations theory proposes the constructive way in which society creates its broad belief systems, emerging from interaction between individual attitudes and the visual and textual images circulating in society. Jovchelovitch (2007) talks about the social and symbolic status of knowledge and reflects on how different knowledge systems ‘enable, meet and communicate in public spheres’. So my concern is the understanding that the frail elderly, who may believe they have become a burden on society, will take from the view that assisted dying is acceptable. Yes, the proposed Assisted Dying Bill is for those with less than six months to live; but once that first step has been taken, the notion of assisted dying circulating in society will of course influence people’s choice in the matter of their demise. Choice is contextual. Of course we cannot fail to be moved by the plight of the high-profile right-to-die campaigners but, in liberalising the law on assisted dying, are we in danger of what Reicher and Haslam (December 2014, p.827) refer to as ‘the privileging of the individual over the social’? So, before we take the first step, could we not use the lens of social psychology to examine research from those countries where it is already legal into how attitudes about assisted dying have changed (or not) and affected behaviour (or not). It also needs to be part of a much wider debate about death and dying and Atul Gawande’s powerful book Being Mortal is a welcome first step. For me it highlights the importance of a greater understanding of the role of palliative care, and the provision of greater resources for that branch of medicine. That would overcome the issue raised by Louise Mullins (Letters, November, 2014) that some support assisted dying because of having seen a parent die slowly and painfully. That need not, and should not, be the case. My father died at 102, blind and unable to carry out the activities of daily living without assistance. He knew how much it was costing to keep him safe and comfortable. He was a strong character and, without a doubt, had the possibility of shortening his life prematurely because he thought it would be easier for his carers, been available, he would have insisted on it. But his last years were full of love and fun for him and the rest of the family. How sad it would be if such experiences were denied to future generations because of a failure to think through the way that a change in the law might affect the social knowledge framing our attitudes about assisted dying. Jovchelovitch, S. (2007). Knowledge in context. London: Routledge. Ancient greece for easing the passage to a psychology degree? Phil Banyard’s article ‘What is happening to A-level psychology?’ (December 2014) raises some important issues regarding the status of psychology for entry into higher education. Whilst it is technically correct that psychology does not feature in the Russell Group’s list of facilitating subjects, it is however somewhat reassuring to know that some Russell Group universities do value A-level Psychology. This is evident through looking at their 2015 entry requirements on their respective webpages. I The University of Birmingham bases their typical offer on applicants ‘taking at least one of the following subjects: Biology/Human Biology, Chemistry, Mathematics/Statistics, Physics or Psychology’. I The University of Bristol states that applicants should have A-levels ‘including at least one science subject’ and that Psychology and can be included as a science subject. I King’s College London lists compulsory subjects with ‘at least one of Biology, Chemistry, Mathematics, Physics or Psychology’. I The University of Southampton has a slightly more generous offer for applicants ‘taking A-level Psychology, Mathematics or a Science subject’. Contrary to Phil Banyard’s conclusion, it seems it could be argued that studying ancient Greek at A-level does not necessarily make you more likely to be accepted onto a psychology degree at a Russell Group University than if you study A-level Psychology. I offer a couple of observations prompted by items in last month’s issue. The Digest report on babies’ anxiety levels makes for interesting reading but ambiguous interpretation. However, I feel that it is misleading to suggest that babies are insensitive to maternal anxiety. As a six-month-old infant I recall vividly lying awake in the same room as my mother, a dispositionally anxious person, who similarly lay awake throughout much of the night. Such was the stressful effect of this upon my mother that she sought help from our GP, who suggested placing me in a separate room. His wisdom took immediate effect: we both slept soundly for the first time! What had been happening was that she had each been listening for signs of distress in the infant and her anxiety had been communicated to the infant by subtle sounds. The net result was that we were each keeping one another awake. Psychologists often underestimate young infants’ levels of social awareness. The Jackson Brown and Gillard article on radical behaviourism defines it as ‘everything the organism does, which…includes private experiences like thoughts and emotions’. B.F. Skinner was once interviewed by the philosopher Bryan Magee in one of his television series. At one point, in an attempt to pin Skinner down, Magee asked him if there were any thoughts going on in his head, to which Skinner replied ‘No’. I’ll never forget the expression on Magee’s face, but I’m sure that Skinner would have been appalled at having ‘radical behaviourism’ considered as part of cognitive psychology. It was somewhat ironic (and, perhaps, a necessary curb on my ego) that the issue of The Psychologist that included a ‘One on one’ interview with me (December 2014) also included a letter from Graham Collins that questioned the fundamental premises on which my work in autism has been based. The question he implies is ‘What’s so special about autism?’, and that is the one I hoped that I had answered over a lifetime’s work; seemingly, not. A letter is rather an inadequate vehicle for once more making my case, but let me address it in outline, at least. The context of Graham Collins’s letter was that of learning difficulties, and the claim made was that there was nothing unique either in characteristics or treatment/educational approaches that would distinguish those with learning difficulties from those with additional autism. Since only around a third of those with autism have additional general learning difficulties, it is not clear what that argument has to say about the majority of those with autism, but I want to address the fundamental point. I would agree that people with autism do not have unique behaviours but rather share human responses with all other groups of humans; the problem of diagnosis is the current reliance on behavioural characteristics. Diagnosticians have to make a clinical judgement, not relying just on behaviours, but on the psychological processes that underlie those behaviours. In other words, those behaviours have a different meaning when we interpret them through the ‘lens’ of understanding autism. Why is this important and different to all other conditions (and to the typically developing)? It remains true (in spite of unresolved issues about fundamental biological differences) that the defining feature of autism is that those on the autism spectrum lack instinctive social understanding, not finding social signals salient, and thus having to learn cognitively (and so be taught explicitly) all the things that others (whether or not they have learning difficulties) just acquire naturally. Humans are social animals, born with a very underdeveloped brain. Most of brain development occurs after birth but, unless you have autism, the learning that determines that development is socially guided. Only in autism are infants left on their own to make sense of the world and to learn how to operate within it. It is not unsurprising if their understanding and ways of reacting are idiosyncratic. In that way, individuals on the spectrum are even more different to one another and do not share many (if any) ‘autistic’ behaviours. This is important in practice, not just because it helps us understand why they behave as they do but because it prevents us from making incorrect and often damaging assumptions about their behaviour. Without understanding autism, professionals and parents naturally assume the social understanding that is there for all other groups. Behaviour that arises from naivety or confusion may then be interpreted as deliberate non-compliance or rudeness. Understanding autism should also lead to the recognition that the educational curriculum cannot just be about accessing the same curriculum as others but also needs to include ‘therapeutic’ content, addressing the missing social and emotional understanding that others (including those with severe learning difficulty) just develop naturally. Individuals with autism will benefit from some of the same approaches that are used for other groups, but the way they are used may need to differ. Behavioural programmes, for example, may need to focus more on making goals explicit rather than on ‘breaking down’ skills into components; cognitive behavioural therapy may need to devote a lot more time than usual in helping the individual understand what emotions are and helping the development of self-reflection. Teaching communication to those on the spectrum needs to include teaching about communication itself – not just teaching the means for communication. Speech cannot be assumed to be underpinned by understanding of communication, as it can for all other groups. Working effectively with those on the autism spectrum, and supporting their development, depends on understanding. The biggest myth of all, and the most damaging, is that one can simply train skills, without that understanding. Maybe I need another lifetime to get the message across. It is certainly well worth a read if only for his discussion, after showing how the pigeon’s ‘superstitious’ behaviour before feeding is produced and controlled in the ‘Skinner Box’, of the bowler who believes ‘his twisting and turning’ will influence ‘the course taken by the ball at the far end of the alley’. Skinner notes that ‘the behavior of the bowler may have no effect upon the ball, but the behavior of the ball has an effect upon the bowler’. Surprisingly, he does not here refer to the movement of the ball but rather to, its ‘behavior’, which seems to anthropomorphise the ball.